While it’s well known that using a cell phone while driving is a recipe for disaster, a study from psychological scientists Warren Brodsky and Zack Slor of Ben-Gurion University of the Negev found evidence that the music teens listen to may also have a hazardous influence on their driving. And it’s not just fiddling with the volume or trying to skip a song that divert a person’s attention away from the road. The music itself can interfere with teens’ ability to stay focused on driving. “Drivers underestimate in-car distraction from activities, which are widely acceptable but not necessarily safe, involving a range of mundane activities such as simply listening to music,” the researchers write in the journal Accident Analysis and Prevention. The researchers recruited 85 novice drivers between 17 and 18 years old. Just over half of the participants were male, and on average they’d had a driver’s license for about 7 months. Each participant was assigned to drive a series of routes along with an experienced driving instructor in a specially wired car. On two of the 40-minute drives, the teen driver was asked to bring along a playlist of his or her own music to listen to. For the other four drives the participant either had no music, or listened to an instrumental soundtrack specially designed by the researchers to encourage safer driving. 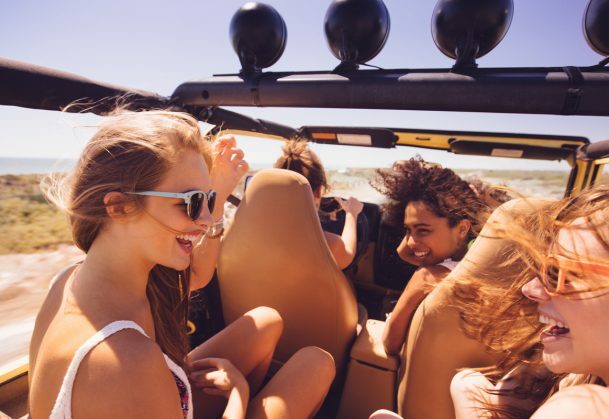 After each trip, subjects completed a post-trip questionnaire rating their ability to drive safely and their perceived level of enjoyment from the music. The accompanying driving instructor wrote a brief commentary describing the driver’s behavior on the trip, and then completed a scale to tabulate any driving errors that occurred. According to data collected from the vehicles, the teens played their own music at much louder volumes than the safe-driving music. They also rated their mood as significantly higher when listening to their own music as compared to the other two conditions. However, they also had significantly more driving errors when they were listening to their own music, including dangerous behaviors like speeding, aggression, and weaving. All 85 subjects committed at least three serious safety errors in at least one of the six trips; 27 received a verbal warning from the driving instructor, and 17 required steering or braking by the instructor to prevent an accident. “Young-novice drivers remain more prone to distraction as they are less efficient in processing visual information needed to drive safely while engaging in other non-driving tasks – such as music listening,” Brodsky and Slor conclude. Interestingly, another experiment conducted by Ayça Berfu Ünal of the University of Groningen found that music didn’t have much of an effect on more experienced drivers. In fact, under certain conditions it may even help improve drivers’ performance. A group of 47 drivers in their 20s and 30s completed two rounds in a driving simulator: one with music and one without. For the music condition, participants were asked to bring in a playlist of their own music.The drivers performed equally well while driving with music and without music; specifically, drivers were better at following another vehicle when they listened to music as compared to when there was no music. Heart rate monitors indicated that listening to loud music increased participants’ level of arousal while driving. “It’s fairly logical – people need a certain degree of ‘arousal’ to stop themselves getting bored. In monotonous traffic situations, music is a good distraction that helps you keep your mind on the road,” Ünal explained. However, she also suspected that while music may not take a toll on mental effort in experienced drivers, it may have a different effect in younger, inexperienced drivers.